Want Murderous Pigeon Plushies infesting your home and personal space? Consider backing Erick Scarecrow’s latest Kickstarter Campaign for Hatoful Boyfriend. 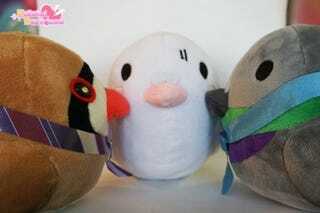 HATOFUL BOYFRIEND OFFICIAL PLUSH PROJECT! HATO MOA x ERICK SCARECROW present limited edition plush based on the best selling video game title. If you’re a one pigeon kind of lover, you can get a Shuu at the $16 tier. Want to see where additional routes to pigeon glory will lead you? Back $25 for 5” pigeon plushies of 3 of the Visual Novel’s stars—Find out the pudding fancies (and fantasies) of Okosan, the sickly nature of Ryouta, and also get a Shuu because there is no escaping his brand of bloody caring. $75 and up goes into sketchier bird territory than I could imagine with Ryouta in a Maid outfit, or a Souma Isa (plus the birds of the $25 tier). At $1000, that’s where things take a dark turn. All of the aforementioned pigeons could be yours, plus a large and in charge 12” plush of Shuu (who doesn’t want that?) plus creator Hato Moa will illustrate a favourite pigeon of your choice for your very own print. The Plush Kickstarter Campaign for Hatoful Boyfriend ends in 32 days, and is currently over $19,000 rapidly nearing its $25,000 goal.